For all of the things that Williamsburg does have when it comes to restaurants, one thing it doesn't seem to have is excellent sushi. We've been trying for a while now to find a place worth visiting twice, but for some reason that's been elusive. Maybe there just aren't enough big money spenders in this part of the city to for a really high quality sushi establishment to survive. The good stuff tends to be expensive, and therefore the best sushi tends to live in places where platinum and corporate cards live too. Like Midtown. Unfortunately, we don't want to eat in Midtown, and we find ourselves in Williamsburg from time to time. And there's only so much fried chicken and Brooklyn Lager that a guy can consume in one neighborhood*. So our search for great sushi in Williamsburg continues, and it most recently lead us to Bozu. Here's the kicker, Bozu isn't even really a sushi restaurant. It's "Japanese Tapas," because of course it is. I think what that means is that they have all kinds of inventive small plates on the strange tiny plastic menu they hand you, a few of which we tried and cared for very little. What that also means is that you won't find straightforward sushi here either. What you will find are sushi "bombs," which are basically rice and fish and other stuff pressed together into a neat dome shaped thing. The bombs we liked. Overall, Bozu is a weird little restaurant that has very obviously been around since before Williamsburg's restaurant scene blew up. You know, back when SEA Thai was the only other game in town, and you had to have funky lounge beats and club lighting in the dining room to stay up with the game. Needless to say, we don't love the vibe at Bozu, and we didn't love the service either. 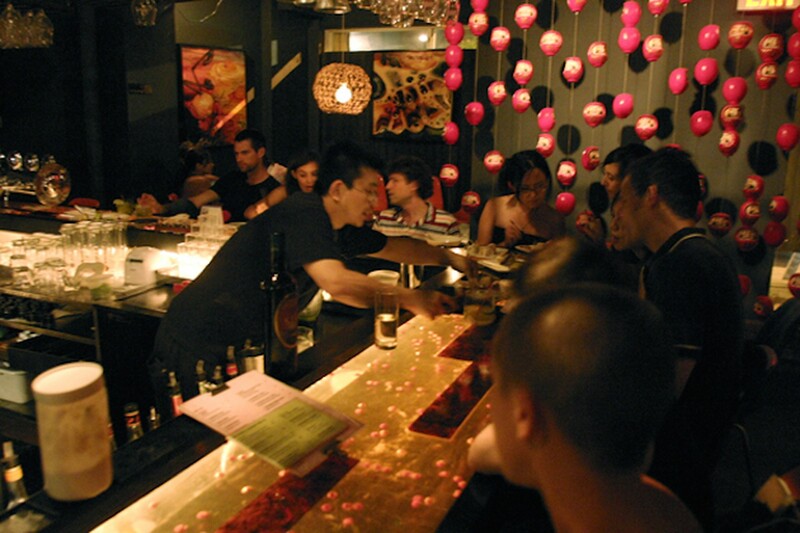 The staff is entirely Japanese, and while they are all very nice, the kitchen seems disorganized and slow. The food in general didn't impress us much, aside from a few of the bombs which were actually pretty good. Check the Food Rundown for more details, but let's just say Bozu is not the Williamsburg sushi we're looking for. Maybe nowhere is. *Redacted: There is no such limit to said consumption. We ordered some steamed shrimp shumai to start and it was pretty much awful. Under no circumstances should you make the same mistake. This is sort of a signature dish at Bozu. It's basically thinly sliced pork belly that's been laid out on a plate in some sake and soy sauce. Think Nobu's famous yellowtail jalapeño dish, but with meat. I didn't love it, but some people sure seem to. To me, it was just too fatty to be enjoyable without the crunchy contrast from the meaty parts that you get in other preparations. This was one of the best things we had at Bozu, thanks to the really good uni sitting on top. It's not a permanent menu item, but if you can't find it, anything you can find with uni sitting on top of it is a safe bet. That's actually probably true for life in general. If it has uni on it, eat it. These are what Bozu has become known for. At first I wrote the whole notion of these things off as a marketing gimmick, but in reality, they are pretty pleasant to eat. There's something nice about a one-bite piece of sushi that perfectly blends all of the intended flavors together into an attractive package for your mouth. Then again, I guess that's what sushi is in the first place. So I guess I'm just confused. Either way, the Yellowtail Bomb (daikon radish, spicy ponzu sauce), the McLow Bomb (tuna, avocado, wasabi cream sauce), and the Spicy McBomb (tuna, cucumber, spicy mayo, kataifi) were all pretty great. And if you see a bomb with uni on the specials menu, you know what to do. For the locals, 1 Or 8 is surely a nice addition to a rather sushi-less area. However, for those of us who have to travel, 1 Or 8 is completely out of the question.